Top and bow-tie have velcro fastening. Top, Waistcoat, Shorts, Bow-Tie, Gloves, Nose and Hat. 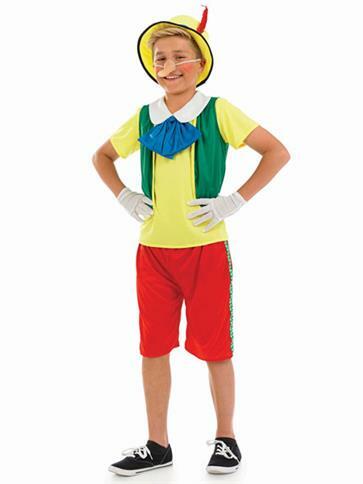 This Fairytale Puppet Costume is based on the well-loved Disney character Pinocchio and consists of a short sleeved yellow top with white collar, a green waistcoat with yellow trim, a pair of red shorts, a pair of short white gloves, a yellow hat with red side feather and to complete the look, an 18cm vinyl nose with elastic to hold in place. Want it Friday, 26 April? Order it within 16hrs and 6mins and choose Premium by 9pm Delivery at checkout.